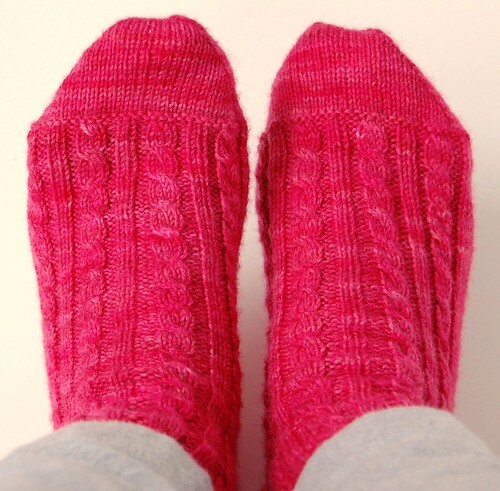 BFF Socks by Cookie A.
Claudia Hand Painted Yarns "Cabin Fever," Size 1 40" circular needle. One last little thing that I also got from Knit Picks is this Namaste Buddy Case. 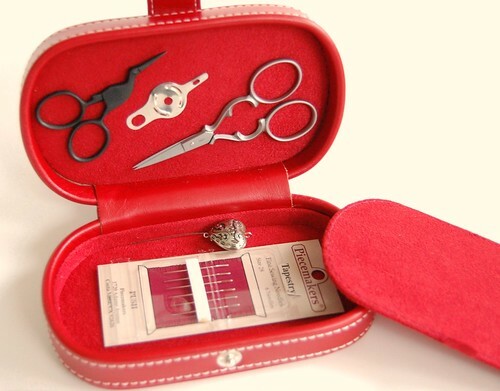 I think it's just perfect for holding all my stitching accessories. Well, nothing else going on here. Just need to clean (as always)! Write soon! I'm visiting your blog for the first time, and it seems we have a couple of things in common. 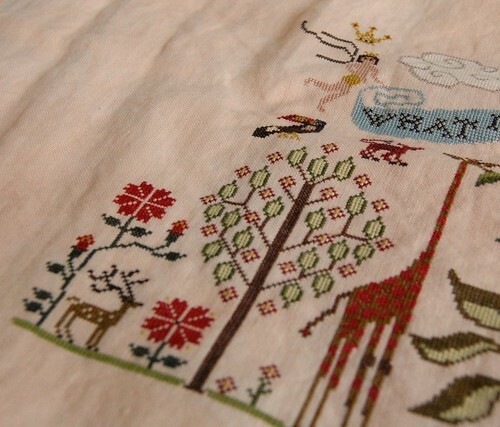 I love to stitch more than anything, even though I've taugh quilting for several years. 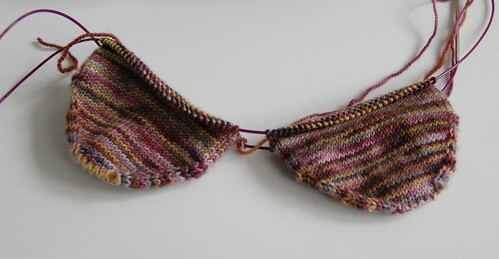 I am finishing up my first pair of toe up socks, and will not knit them from the cuff down again. Way easier. And I'm on Goodreads. A friend invited me and I enjoy it. 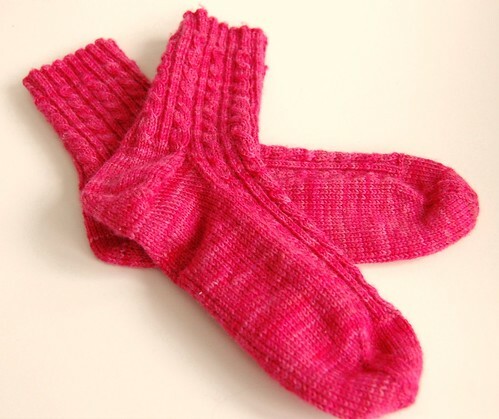 Congrats on finishing the socks! They are awesome!!! And love the others (they really do look a bit like a bra!). PL is looking great, gotta get it done so you can start The Flood after Market! I love your socks Nicole. I've always wanted to try making some of those, but I'd be afraid that if I made them I wouldn't want to wear them - kind of 'defeats' the purpose! LOL That second pair definitely looks like a bra! Love your progress on PL - it's such a great design and you'll be just in time for the Flood when it comes out this month. I love the Paradise Lost, it's absolutely gorgeous! Nice socks! Nice bra! lol! Just kidding. Love your Paradise Lost too. Gorgeous socks! The colour is just awesome. Nice socks! At first glance I thought your next knitted project was going to be a bra! Paradise Lost looks good too. Cool socks! OMG Nicole...Paradise Lost is so pretty....you better need to finish this one soon!!!!! Love those socks!! The others look great too - although I too thought you were making a bra at first! Paradise Lost if beautiful! I hope to get to that one some day! Oh, Nicole... I just love Paradise lost... your knitting is beautiful too...! you're so talented! Paradise Lost looks amazing. I recently bought the pattern and am dying to get it started. Love the socks too. Nicole! At first glance I thought you were knitting a bra. Sure would be comfy. lol I'm loopy - long day with Z's birthday bash and more ... time for bed. Oh and Ben goes back to school tomorrow after being home 7 ... see my smile?! LOL, I have to say the little double sock thing, looks like a crocheted bikini top :-). Love PL, mine is coming back out in the next few weeks, I want to finish it and get it on the wall. great socks and bra. ;) can't wait to see the socks finished. Paradise Lost is looking gorgeous! GREAT socks!! I really do need to knit that pattern up this year. I always mean to and then get distracted by some other pattern but yours are so wonderful so now I have to do it. Paradise Lost looks so good. You really have stitched a lot of it. You are making great progress on Paradise and the new socks - I love them! Love the socks...they look so cozy! Paradise Lost looks great. We have embroidery in common. I love stitch and Knit. Congratulations for your socks, they are very beautifull.